The HP-19C and HP-29C both have continuous memory capability so the programs you store are saved, ready for use, until you clear or overwrite them. You can merge up to four keystrokes in each of the 98 steps of continuous program memory on both the HP-19C and the HP-29C. Caption: Two new powerful keystroke programmables from Hewlett-Packard. The new HP-19C with Continuous Memory and printer. 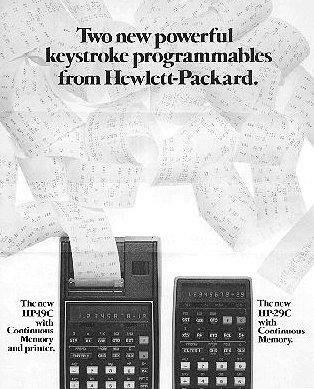 The new HP-29C with Continuous Memory.